The *BOOM* of fireworks and bare trees indicates that we’re more than halfway through our autumn season now. It can be an unsettling time of year. We are in shock from the early descending darkness and it isn’t yet time to think of Christmas. It’s plain cold, and the colourful autumn leaves are just litter now. But this is an important time of year. The trees have shed their leaves to concentrate their energies back into their roots, to build a strong foundation for the winter ahead and beyond to grow again in the spring. It’s a naturally grounding time, a time to look inward, conserve energy, and strengthen foundations for times ahead. We are part of this universal web of life but that’s something we easily forget. Our natural rhythm is also to turn inward at this time of year: to reflect, re evaluate and refocus. But our busy lives often mask this natural rhythm and we feel ‘out of sorts’, have trouble adjusting to the change in daylight and the cold months ahead only fill us with dread! But we may still have inklings of our desire to turn inward. This may be not wanting to venture out so much socially, preferring to settle into the sofa (would X Factor have been such a hit if it had a summer scheduling?). We may try to fight against this instinct and carry on at the pace of the outgoing summer months, wondering what’s wrong with us for not feeling enthusiastic at the prospect. When we honour our body’s natural rhythm, we make the transition into winter a far less rocky road and make healthier changes than just hibernating on the sofa with pudding and custard instead of ice cream! Recognise that things change – always. The seasons change, and they come back round again. So it goes that our routines can and probably should change in line with that. Now is the perfect time to think about whether your routines are still working for you. Should you switch your run from evening to morning and go to bed earlier? Would the run up to Christmas stress be more manageable with a yoga class instead of body pump? Would you rather forsake the sailing club winter drinkies meetup for salsa classes or a language night course? If we take the time to evaluate our routine, we can put in place healthier alternatives that are a better fit for the season. Otherwise there’s every chance we’ll just veg out on Downton Abbey reruns and emerge for the spring having missed some great opportunities to keep living life! So, a little more about food (it’s always going to happen here). You can embrace this season’s offerings and fulfil your need for comfort and warmth with healthy choices. Swap the imported strawberries, blueberries and raspeberries for more seasonal coloured fruits and retain your dose of antioxidants and vitamins. Think plums, fresh figs, dark grapes (preferably organic) and look out for gloriously smooth and sweet persimmons. Add seasonal roots to your plates with carrots, beetroot, sweet potatoes, parsnips, turnips, swedes, etc. Packed with nutrients and natural sweetness to curb sweet cravings. My husband had his cold weather dinner of sausage and mash last night but swapped the white spuds for sweet potatoes and preferred it. Sign up for my Take5 Series of healthy seasonal veg recipes for inspiration. Roots have a ‘grounding’ quality that complements their season and help give us calmness and clarity. Use warming, calming spices such as cinnamon, cumin, turmeric, allspice and ginger in your cooking. Rub them into meats, use them in soups and even incorporate them into autumn salads. 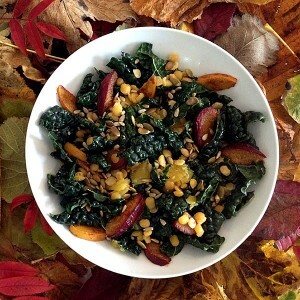 This is a variation on the Kale Orange Salad featured in my Take5 Series – Sign Up Here. The addition of yellow split peas and the warming spices were inspired by my own health coach’s recipe from her glorious Autumn Focus Cleanse, and the addition of seasonal fruit really embraces the flavours of autumn. It’s a timely swap for those summer salads, bringing warmth and sustained energy. Make double and keep half for the next day, as the flavours marinate the kale beautifully. And it doesn’t wilt like the usual salad leaves would! Preheat your oven to 180c and line a baking sheet with foil. First cook the split peas by rinsing thoroughly and placing them in a large pan with 2 cups of water. Bring to the boil then simmer gently for approx 20mins. We want the peas to retain their shape and not turn to mush, so keep an eye on them. A large pan with plenty of room for the peas helps them retain their shape. Once your peas are simmering, prepare the plums:Squeeze the lemon into a bowl, add a tablespoon of olive oil and all the spices and mix with a fork. Bake gently in the oven for approx 10 minutes, until just golden but still some firmness. Remove when ready and cut into bitesize pieces when cooled enough. When the split peas are cooked, transfer them to some kitchen paper to absorb the remaining moisture. Peel the orange over your serving bowl to catch the juices, then cut the flesh segments out of the pith. Cut these in half in your bowl. Add the kale pieces and a tablespoon on olive oil to the bowl and mix thoroughly to coat the kale pieces with the oily, juicy loveliness. Add the split peas and roasted plums to the bowl and mix again. Finish off by lightly toasting the seeds in a dry pan over a high heat. Move the seeds around until they are slightly browned. Scatter over the salad and enjoy! This is great on it’s own at lunchtime or paired with rolled pork as a substantial and healthy side dish. What changes do you think could benefit your autumn wellbeing?